'The Handmaid's Tale' Wants You To Feel Like 'This Could Happen Here' Elisabeth Moss and Samira Wiley star in Hulu's TV adaptation of Margaret Atwood's 1985 dystopian novel — in which fertile women become reproductive surrogates for powerful men and their barren wives. In 2016, Atwood told us that the idea started as a question: "If you want women to go back into the home, how do you make them do that? And the method I proposed in 1985 was, now that we have credit cards, it's very easy to just cut off people's access to credit. And that's what happens in the book." That's also the premise of the TV adaptation of the book, now streaming on Hulu. 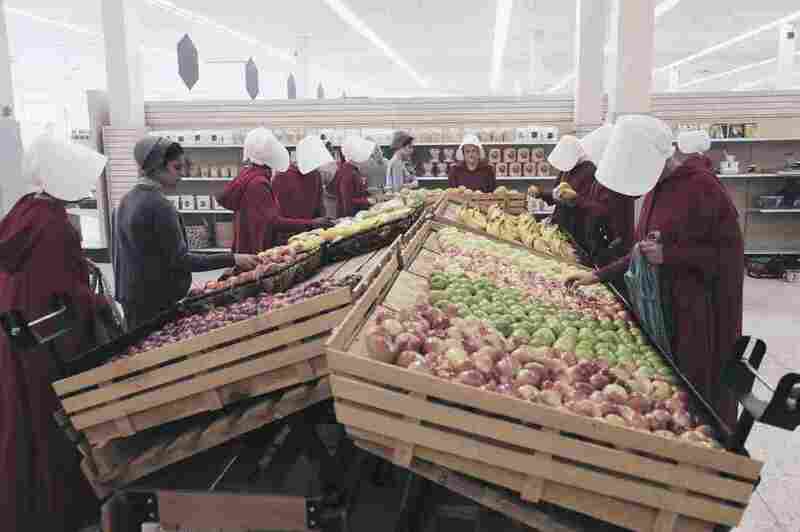 In the imaginary Republic of Gilead, women are not allowed to own property or have bank accounts, and because of widespread infertility, those who have successfully had children are assigned to be Handmaids — bearing children for the rich and powerful. "It was very important to us from the very beginning to make sure that people understood that this is present in a 'this could happen here' idea," says Elisabeth Moss, who stars as Offred. Samira Wiley plays Moira, Offred's best friend from "before Gilead." She describes her character as a feminist in "every way, shape or form." Moira (Samira Wiley, left) and Offred (Elisabeth Moss) are best friends "before Gilead." In flashbacks, their world seems normal — they go for jogs, talk about Uber and Tinder, and organize protests. Samira Wiley: It's not supposed to be an insult. ... It comes from a place of love, it comes from a place of wanting his wife to feel safe, but Moira is very, very sensitive to that language. ... She feels like she is standing up 100 percent for what she believes in and where women should be in the present. And if anyone comes even close to jeopardizing that, it is her responsibility to nip that in the bud. Elisabeth Moss: That scene, it's directly from the book and it really sets up this complexity of what is my husband supposed to say? The women now don't have access to any of their money and of course my husband loves me and just says what comes naturally which is: I'm going to take care of you. And of course that brings up the sensitive issue of, oh great, now I have to be taken care of. Moss: It's another interesting thing raised by Margaret and by the show, which is: A really good way to control women is by using other women. And we also play the opposite, which is women, when they stand together, can be incredibly powerful. Ann Dowd plays Aunt Lydia and when she speaks about the character, from her perspective, she loves these girls. She believes she's actually doing a good deed and good service by protecting these women. And that's one of the things about the show is, we provide these different points of view and make these characters complex and not black and white. Moss: Not weird. Awesome. So, so, cool. This costume, this color, the bonnets — they're so iconic. And they stand immediately for feminism and women's rights. You take one look at that costume and you know what that girl is doing. You know why she's wearing it. And so, for me, seeing something like that is so incredibly moving. Moss: I think that's one of the great things about it. There are many different ways of resistance, and all of them should be used. Marching, talking, conversation. Margaret has a quote that I love, which is: "A word after a word after a word is power." And she also says: "You can mean more than one. You can mean thousands."